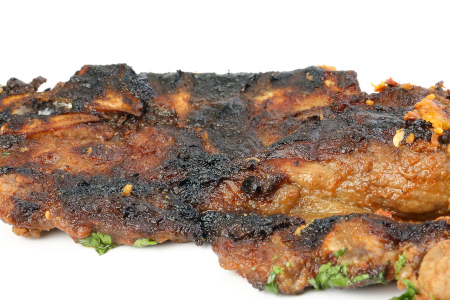 Well here goes with one of the most easy, best, barbecue grilling recipes ever. This is my favourite way to cook lamb on the barbecue, nothing fancy, just simple flavours that complement the grilling process. Sometimes you read barbecue grilling recipes that can over-complicate things, this recipe is just about simple fresh ingredients and a butterfly leg of lamb. If you go to your butcher and ask him or her to butterfly it. He / she will remove the bone and this creates one big slab of meat about 2 inches thick. If you want to learn how to butterfly a leg of lamb yourself then this is what to do. Place the leg on a board, meatier side down, on a large chopping board and feel for the bone with your fingers. Take a sharp knife and cut down the length of the leg along the bone. Keep your knife close to the bone and with gentle strokes scrape the meat away from the bone leaving as little meat on the bone as possible. Continue to work around the bone with your knife until you are able to lift the bone free. You now have an open slab of meat, it may vary in thickness a bit so cut down through any thicker parts to open the leg still further. Remove any excess fat and sinew. Note:- This recipe can be done with lamb shoulder too. Shoulder contains more fat and connective tissue than leg and in my opinion it has more flavour. On the down side it can be a bit chewy and the fat will cause a flare up if your coals are fresh.If you want to use shoulder then read how to butterfly lamb shoulder. When you've finished the small amount of preparation you can just slap the slab of lamb on the grill an enjoy watching a light smoke emanate as the fat renders. A few soaked sprigs of rosemary on the coals work wonders for adding a smoky flavor. This is one of those barbecue grilling recipes that requires patience and gentle sizzling over a lazy Summer afternoon with a large glass of wine! 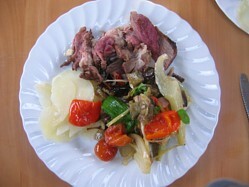 I served my lamb with grilled potatoes in creme fraiche and a selection of roasted vegetables. There are no processed ingredients in this recipe so no allergens. Peel the cloves of garlic and slice the cloves along the length to create pegs. 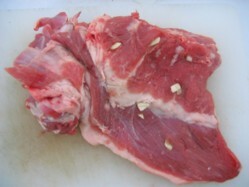 Use the point of a sharp knife to make incisions into the meat and insert the garlic pegs. Massage in salt and pepper at the same time. Remember to make sure your barbecue grill has settled down because lamb is quite fatty and it can cause the coals to flare. While waiting this is an ideal time to prepare the potatoes and get them on the grill. You’ll notice that the “inner” side of the lamb contains no fat so grilling this side first minimises the risk of flaring but I prefer to do the fattier side first. If your grill is well settled then go for the grilling the fattier side, this provides a layer of protection for the meat, maintains succulence and adds smoky flavour as the fat renders onto the coals. 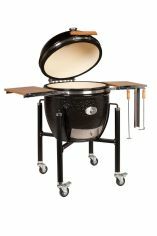 You will probably find that it is better to grill on this side for longer and then a shorter time for the flesh side - I find that this works well if you like your meat rare and want to be particular about how well it is cooked. TIP - For added flavor you can also throw a few sprigs of rosemary (soak for 30 minutes first) onto the coals. 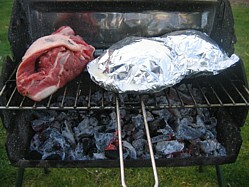 Here it is grilling away with foil packs of potatoes in white wine and creme fraiche. Grill to your liking of course, I’ll do mine pink so about 40 minutes in total (dependent on thickness), step that up to 50 if you like it well done. TIP - For the touch test; If its soft to the touch it’s rare, if it’s firm and the juices are forming on the outside of the meat then it’s well done. These temperature may seem a little low but after you have rested the meat (essential) for 10 minutes then the core temperature will have increased by more of less 5°C (9°F) and now you're ready to carve. A sprinkle of smoked sea salt over the sliced lamb works a treat too.